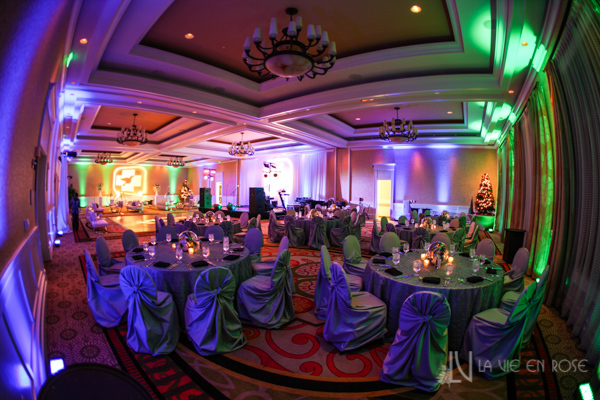 We loved designing and producing the River Crossing Group’s corporate holiday party at the Sandpearl Resort in Clearwater Beach. 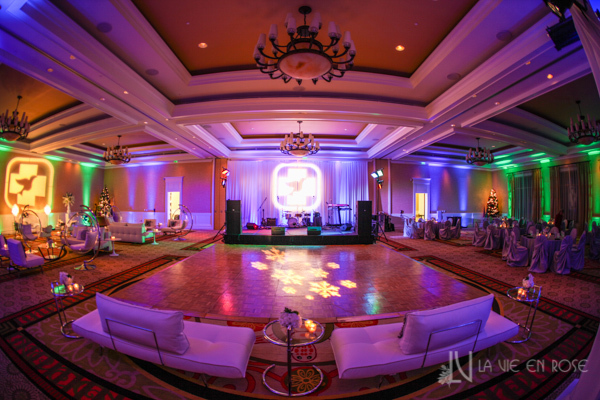 We started by custom designing the floor plan to give shape to the flow of that evening’s events. The client wanted an area for dining and seating during the awards presentation… to be followed with entertainment by a live band. They also wanted to keep it classic and elegant. We covered the guest tables with our silver linens and chair covers to keep it neutral… letting the company colors come from other sources… like the florals, lighting. 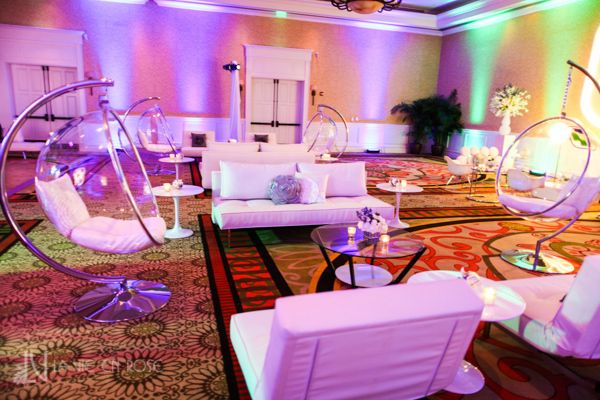 We created an informal area separate from the formal presentation so their guests would be able to enjoy dancing and conversation. We brought in our line of mid century modern lounge furniture to enhance the room. Both, stylish and functional, adding a cozy feel to the room. 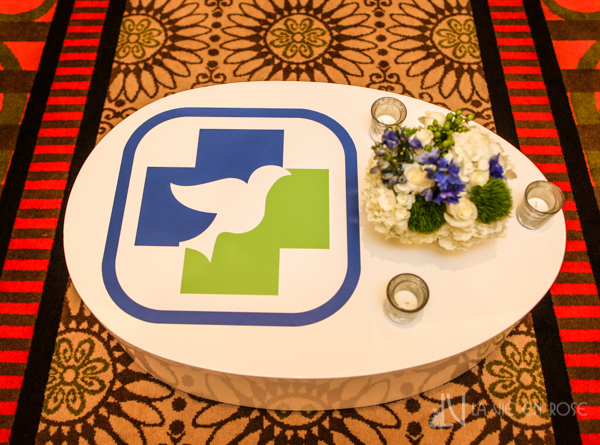 To brand the event we added the company’s logo to our furniture and walls. This brought a cohesive flow to the room and made it more personal. 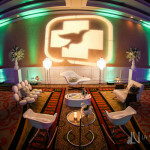 Floral arrangements were a great way for us to finish the decor and reinforce the company colors… while our lighting and fabric draping helped to set the mood. Snowflakes added a nod to the holidays on the dance floor. 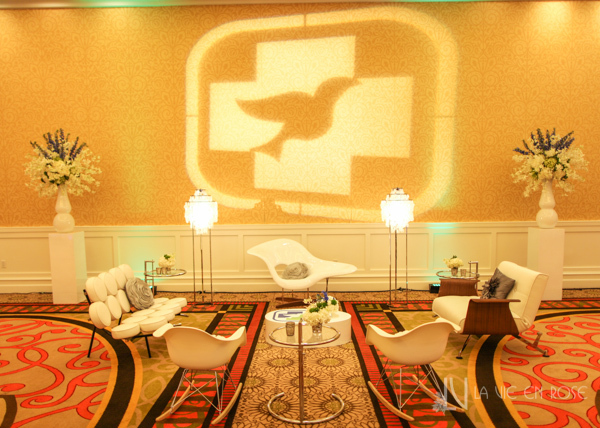 Lighting was a great way to play up the feel of the room… again reinforcing the company colors. Our iconic mid-century lounge grouping… Eames le chaise, Eames eiffel rocking chair, Eileen Gray side table, Mother of Pearl floor lamp, and marshmallow sofa available exclusively through La Vie en Rose. Personal touches like this enhance the guests overall experience making it memorable. 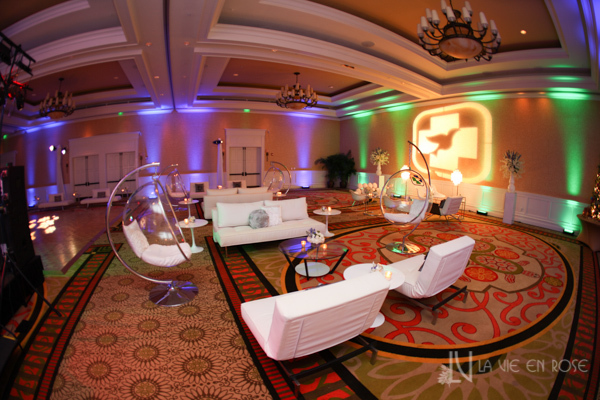 This stylish and functional furniture was a perfect match for this corporate event. 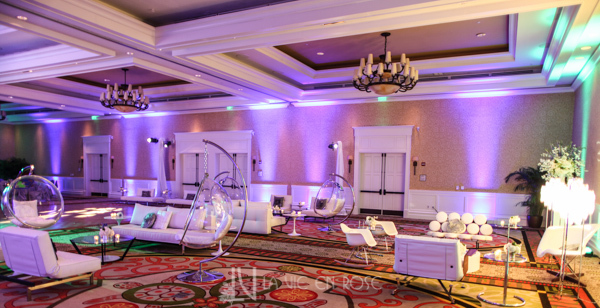 The bubble chairs made guests feel like they were floating as they swung to the sounds of the music. 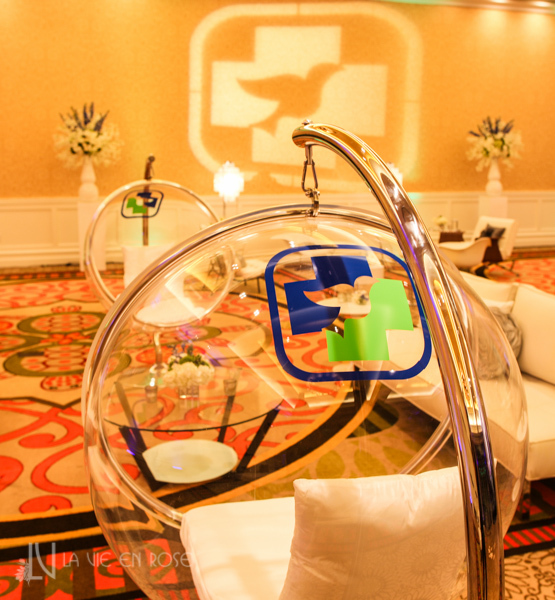 Custom printed company logo on the clear bubble chairs were a huge hit… with many guests using them for photo ops. 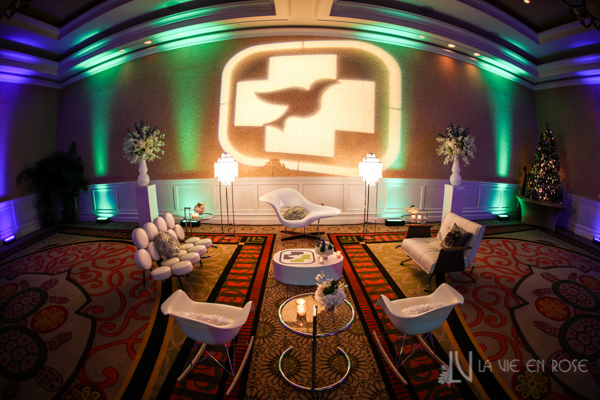 We custom printed the company logo to brand our bubble chairs… making it one cohesive event. 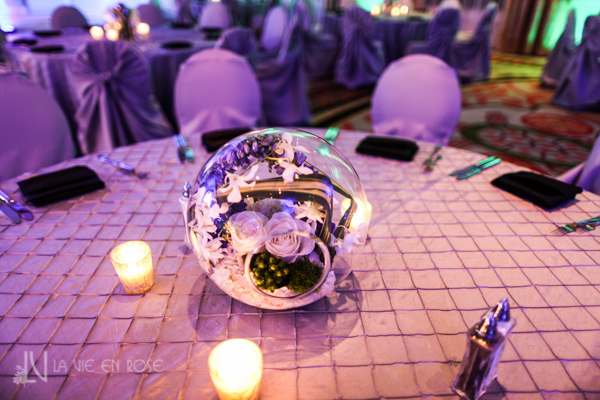 Artistic globes filled with Roses and Hawaiian Orchids. Smaller floral arrangements mimic the larger globes for the lounge area. 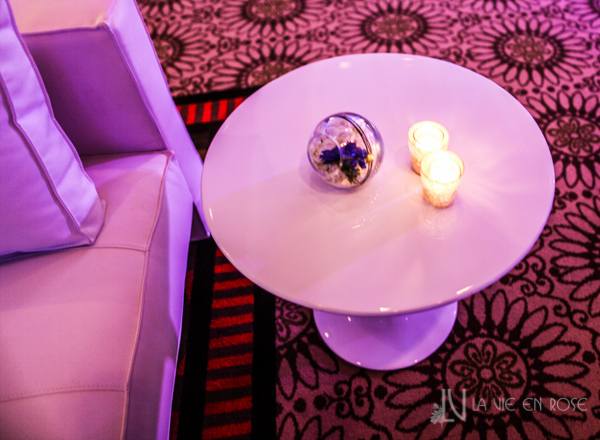 One of the most popular seating areas for the evening. The le chaise chair was a favorite of the guests. 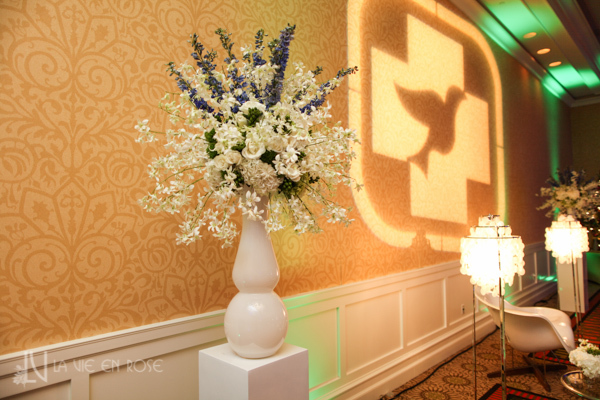 We projected the company logo on the wall framed by our large floral arrangements full of Hawaiian orchids. Notice the use of company colors in the floral arrangement.